I didn't write today's post. Considering it's about Lake Ontario Steelhead, that probably doesn't shock you, despite the fact that I do own an underused NY state fishing license. Larry Chandler is the author who did approach me the other week to write this post...and although he's not that "underground trout" Chandler guy, it's still a very nice piece, clearly much better than I could have written if I tried. Plus since I don't typically write about steelhead, it should be good fodder for all those Googlie-Mooglie search engines. So enjoy the read, on what is hopefully a nice, lazy Saturday for everyone. If you have been lucky enough to fish the Lake Ontario area of New York you are likely aware of the excellent steelhead fishing. The state of New York has invested time, money and effort in stocking these beautiful strains of rainbow trout throughout the waters. The state even had the good vision to stock not only a winter strain but a summer strain too, providing more opportunities throughout the year to catch a trophy. In the winter anglers can go after the Washington steelhead. Most of the time the run will hit its stride at the middle of October and last until sometime in November. As water temps cool off during December and January the action noticeably drops. However, the middle of March signifies the spawning period and the fish are ready to bite again. Starting at the beginning of May the Skamania steelhead will start to move in to the river. As of this writing the Skamania are only kept stock in Little Salmon River as well as Salmon River. The height of the run for the summer fish usually begins in June and will last all the way until September. The Skamania are a little more skittish and tend to be a tougher catch. Experienced anglers have seen their best results immediately after a hard rain or a rise in the water level due to a recreational release of water volume. One of the attractive features about fishing for steelhead is the variety in techniques that are used. If you like finesse fishing with light line and long rods, then you will enjoy the spinning reel strategy used by many people. Rods can vary from 8 feet up to 14 feet and the lines may be as big as 10 pound test are as light as 2 pound test. What if you prefer the traditional fly fishing method? No problem. The common setup for steelhead is a 10 foot long rod along with 7 weight fishing line. A fast, smooth fly reel is essential to handle the quick-as-a hiccup moves of these fish as they dart away once they are hooked. For those that like to drop a bait in a strike zone and patiently pass the time while the water moves the lure along, float fishing is a great method for landing a steelhead. Long rods, up to 14 feet, are perfect for this technique. The length allows the angler to make a good cast, keep the line from setting on the water’s surface and to set the hook when the bite hits. Like most types of fishing, the most effective lures are the ones that resemble some type of prey naturally found in the tributaries of Lake Ontario. Mayfly, fish eggs, leeches, minnows and caddis fly larvae are some of the best examples. 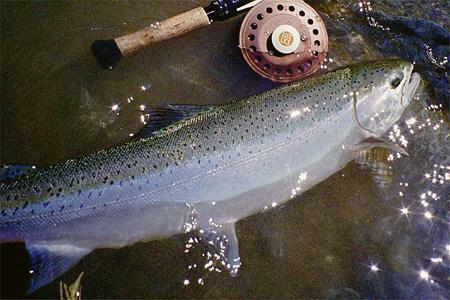 Since these fish have great speed and power it is not uncommon for anglers to lose a steelhead in the first few seconds of the bite. It is vital to take up all the slack line immediately when you get a bite. Then, allow the fish to run and let your reel’s drag take over. Maintain pressure by keeping the rod near the water and move the rod side to side. This keeps the fish out of balance and will cause it to tire. If you want a real fight with a dandy of a fish, try out one of the tributaries of Lake Ontario and launch into one of these beautiful steelhead. You won’t be sorry. Larry Chandler is a freelance writer and trout fishing enthusiast. When he is not on the computer he enjoys being outdoors and spending time with his family. T!,you gotta hit the salmon river up at Pulaski NY for steelhead! Great people,great fishing,superb people! For those who ideally want to avoid the big crowds and simply take in the pleasure of having the lake as their only companion, many smaller communities present picturesque marinas to dock your boat and just as many hidden destinations are still waiting to be discovered. Lake Ontario boasts hundreds of miles of shoreline beautified with sandy beaches and fishing holes challenging you to lure in salmon, walleye, large and small mouth bass and more. Can't wait to go back.